WolfQuest MN Zoo and eduweb (U.S.A.), MN Zoo and eduweb (U.S.A.), 2007 Download it Now ! 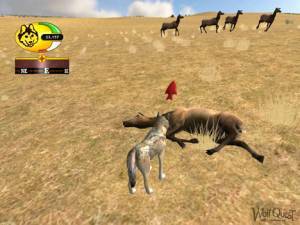 WolfQuest is an interactive 3D wildlife simulation computer game. WolfQuest players take on the role of a wolf living in Yellowstone National Park. Through trial and error, instinct and experience, players learn about the life of a wolf as they hunt and interact with other wolves.